Gosh, I took these pictures so long ago, like right after Clarisonic brought out Alpha Fit For Men. 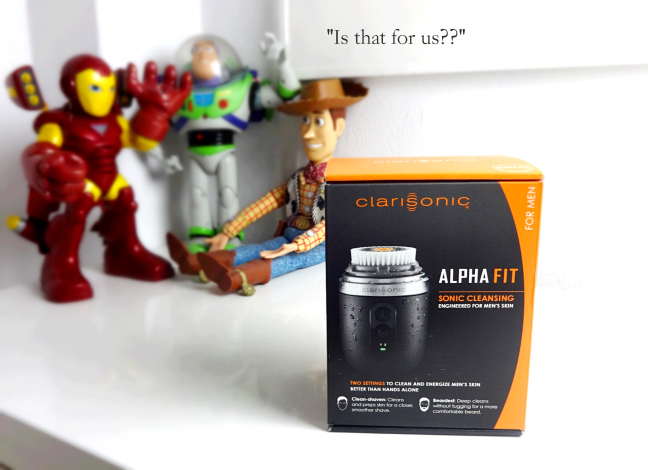 At that time, my SO was involved with the Alpha Fit online project and the Clarisonic team gifted one to him when they flew in New York. I told him right away that this wasn't going to be a hit and Clarisonic would change the dark gray exterior color into something soft and name it like "MIA Fit". A prophecy. The set comes with one Clarisonic Alpha Fit, a USB charger/standing disk, and a gel type facial cleanser. I have to say the only thing I liked about it is the dark gray/orange color scheme. This was obviously destined to be mine (I mean, I can barely make my SO wash his face twice a day. The man doesn't even use facial soap and still has better skin than mine. Unfair. ), so I hoped that it would feel more ergonomic and compact than my MIA 2. But, it isn't. It is quite heavy and bulky. I don't know if MIA Fit is lighter and smaller than Alpha Fit, but it certainly doesn't feel "fitting" in my hand. 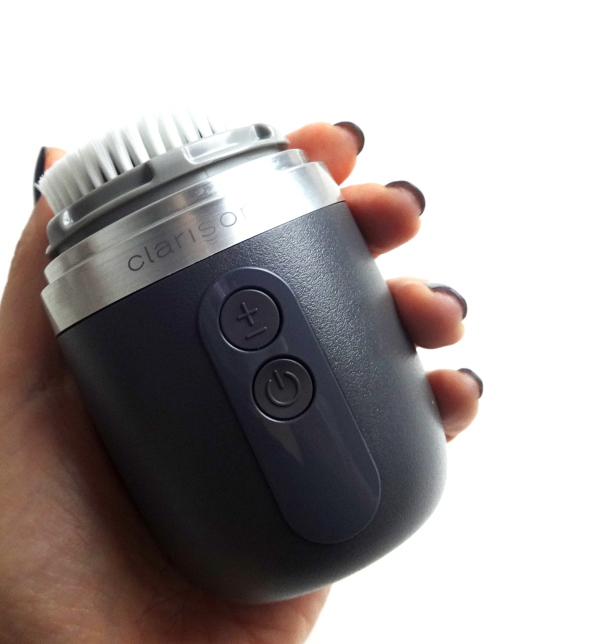 Maybe Clarisonic focused on making something that doesn't look too feminine and I think they succeeded because Alpha Fit does look like an electronic shaver. 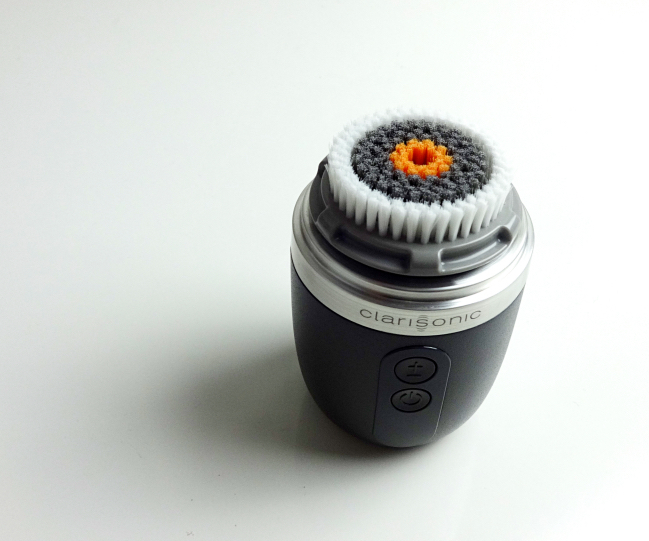 The bristles are shorter and on the stiff side - Clarisonic says it is optimized for a bearded man's face that tends to be "thicker"(haha). As far as I know, there are as many men complain sensitivity and ingrown hair due to irritation, so I'd encourage gentlemen to feel free to opt for softer brushes. 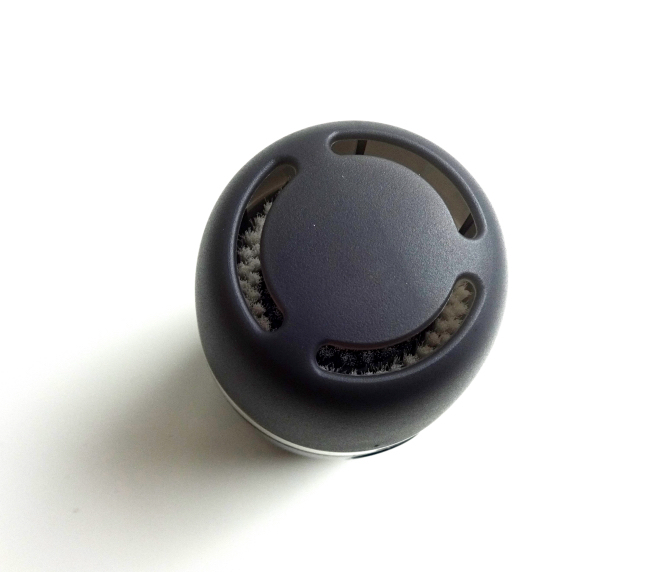 Luckily, Clarisonic offers different types of brush heads that are interchangeable. Compared to MIA 2, the setting and the spinning movements are slightly different but not so much that I think this men's version is revolutionary or a necessary addition to the lineup. The gel cleanser was so obnoxiously scented and drying that I threw it out. Have you tried or gifted this skin care tool? What are your thoughts? I'm still enjoying my MIA 2 as well. I never used it for daily cleansing but love it as an exfoliating method! But, it takes forever to charge so I'll start using this Alpha Fit (with a different brush head) to see if it charges better. I hadn't heard of this, but it looks pretty interesting. i can see how it's geared towards guys, but think that many don't have much of a skincare routine! Haha I remember you mentioned this to me during one of our conversations Lena ;p I meant to tell you that I ended up buying one for my husband because the old Clarisonic Mia of mine he was using conked out. He says it's a little more scrubby but he likes it and the stand up format is better for shower storage. I don't know how I convinced him to get onboard with a skincare routine but I'm not gonna complain now LOL I have tried this brush and I still like my Mia 2 more that I use with the cashmere brush head which is my favorite. We thought the gel cleanser was a dud as well and dumped it. 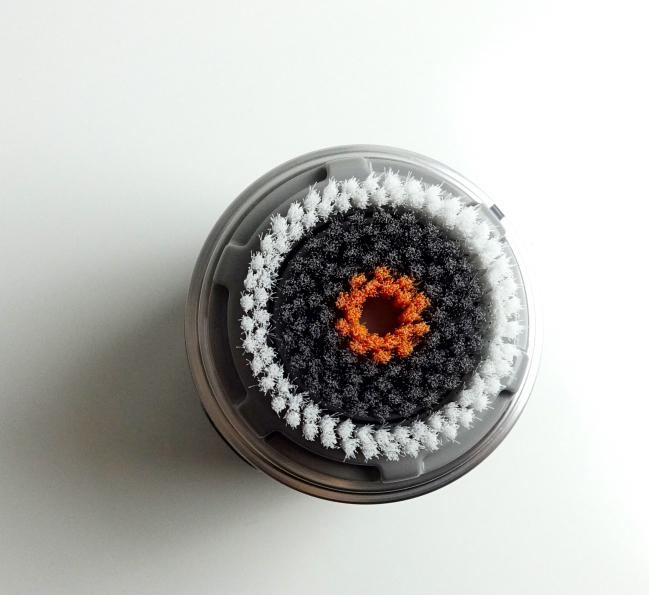 It looks a bit like a potato brush...I would be too chicken to use stuff this scrubby one my face but it seems so handy for body during winter. Haha, I have the Mia Fit and I really like it! Totally with you on picking the softer brushes though - the Radiance is the only one I can use on my face, the others are all too rough. 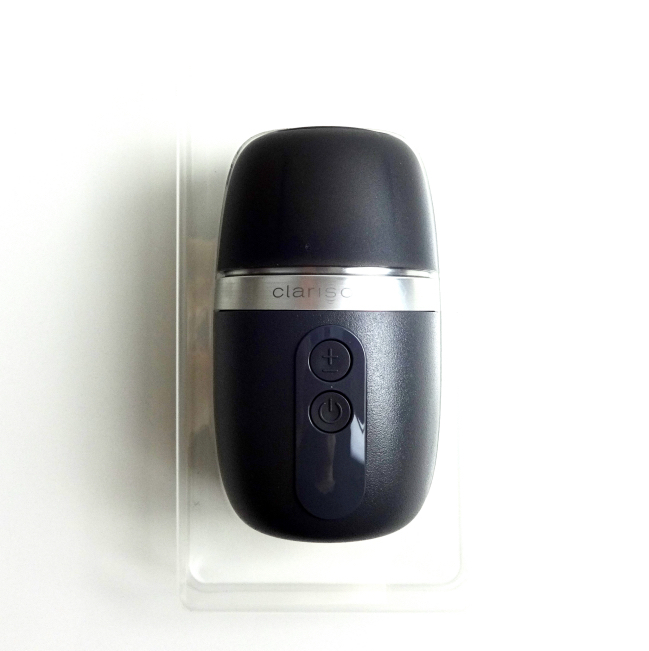 I remember using Clarisonic years ago, then did not use it much at all. Now, I just use a similar but much lighter version sponge or the one I got from Vanity Planet on my face. I also like the grey colour. Isn't it funny how some guys just have great skin. My boyfriend is the same, he barely uses anything other than Kiehl's cleanser but has flawless skin.